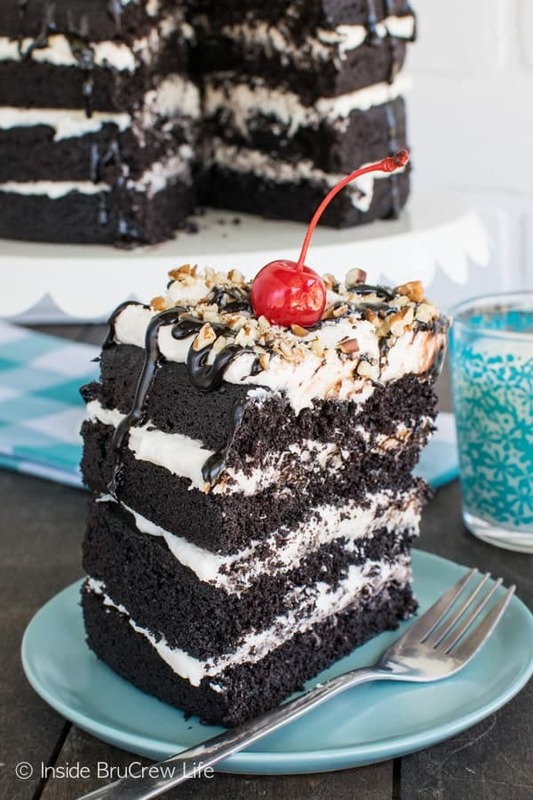 This Dark Chocolate Layer Cake is filled with a fluffy frosting and topped with hot fudge, pecans, and cherries. It is the perfect dessert to enjoy for any life celebration. I am officially old. At least that’s what our kids keep telling me over and over. I guess I remember thinking my parents were ancient when they were my age. But honestly, I do not feel my age at all. They say 40 is the new 20, so that must be why I still feel young. Although, I have seen and been around some 20 year olds…and I don’t think I want to relive those years again. 20 year olds look and act about 15 some days, so I think I’m going to start saying 40 is the new 30. Usually by 30 you have settled down and figured out what life is all about and what you want to do with your life. You also usually realize that cake every once in a while is a pretty good thing to enjoy. This past weekend was my 40th birthday! All morning long my daughter kept asking what we were going to do. It’s so funny how when you are young, you have to have big plans and celebrations on your birthday. As you get older, it’s just another day in your life…with cake, of course. We did lunch out as a family, and then we stopped at a store to pick up some pots and cactuses. You can imagine the horrified look my daughter had when I told her that’s all we were going to do for the big day. To her that was such a boring birthday! My husband offered to make me a cake…ok, he actually offered to go buy a cake for me, so that I could take the day off from baking. But I actually love making my own cake every year…and I’m actually a big dessert snob. 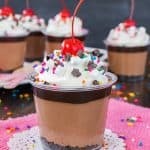 I have been making desserts for so many years now, that other desserts and treats do not impress me often. So, I like to come up with fun birthday cake ideas. Making my own cake is actually enjoyable and super fun for me to do. There is no stress about it, and I can do whatever I want to it. One year I made this chocolate chip banana cake with honey peanut butter frosting and decorated the outside with a basket weave pattern. It was fun to do and tasted amazing. This year I had chocolate on the brain. 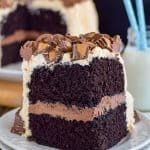 I wanted a rich dark chocolate cake layered with fluffy frosting and topped with fudge and pecans. It just sounded like the perfect cake to celebrate hitting 4o with! 4 layers of cake to celebrate each decade of life! 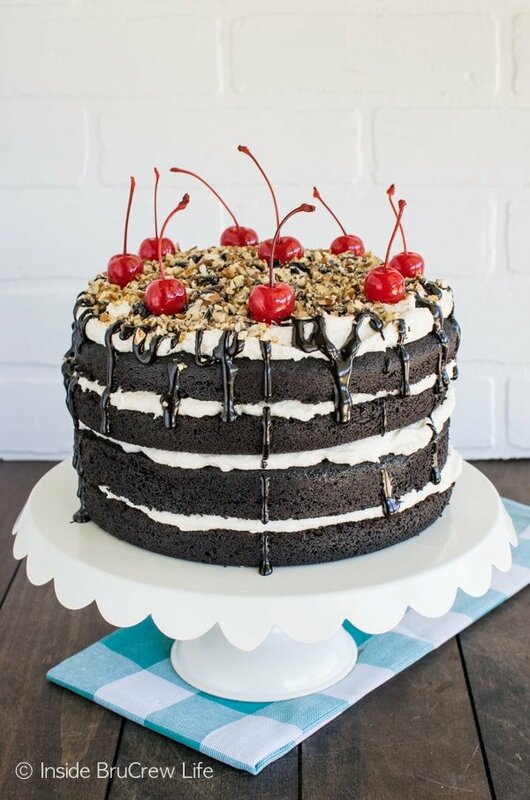 I added the cherries on top at the last second because all of a sudden this dark chocolate layer cake was looking very brown and boring! Bright red cherries with stems always add a fun pop of color and fun to any dessert. 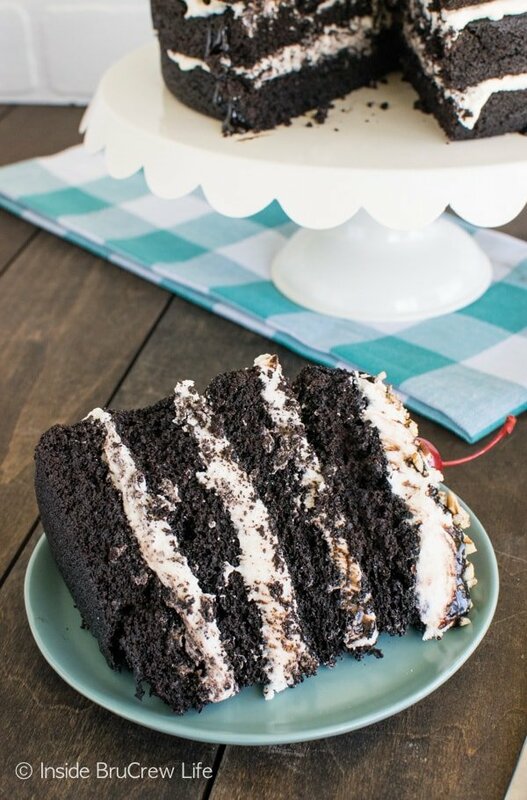 Layers of dark chocolate cake, frosting, hot fudge, and pecan chips make this Dark Chocolate Layer Cake an impressive cake to serve for any dinner party. 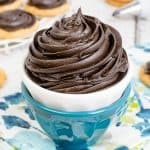 Stir together the flour, dark cocoa powder, baking soda, baking powder, and salt in a bowl. Alternately add the flour mixture, buttermilk, and coffee to the butter mixture until everything has been mixed in completely. 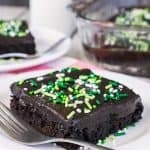 Divide the cake batter into 2 - 8 inch cake pans that have been greased and dusted with cocoa powder. Bake at 350 degrees for 35-37 minutes or until a toothpick comes out mostly clean. Remove the cakes from the oven and let cool for 15 minutes in the pan. Flip out onto a wire rack to cool completely. Cut each cooled cake in half, horizontally. Beat the butter and shortening until creamy. Add the marshmallow cream, vanilla, rum extract, and salt and beat again. Slowly add the powdered sugar and whipping cream alternately until everything is mixed in. Beat on high for 1-2 minutes or until light and fluffy. Place on cake layer on a plate. Spread 1/4 of the frosting on top. Repeat with the cake layers and frosting. 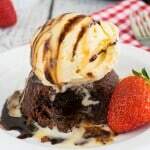 Heat the hot fudge in the microwave until it is warm enough to stir, but not hot enough to melt the frosting. Drizzle over the top of the frosted cake. Sprinkle with pecan chips. 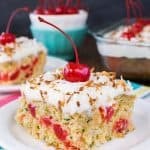 Top with the cherries. Happy Birthday!! And yes 40 is the new 30..I’ m still a few years away but that’s what I’m going to tell myself 🙂 And Cake is always a great way to celebrate! 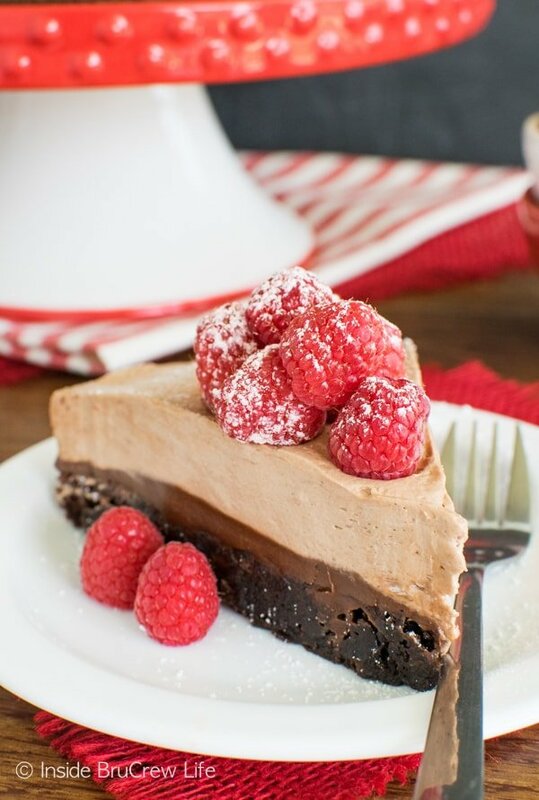 And this one looks fudgy and delicious- and pretty sure calories don’t count on your birthday am I right? Happy Birthday! And I love your birthday cake! Happy Birthday Jocelyn!!! The cake looks amazing and sounds delicious, can’t wait to make it for my crew! 🙂 Have an awesome rest of the week celebrating the big 40!!! Thank you so much! I hope your family enjoys it as much as we did!!! Happy Birthday sweet friend. Welcome to #team40 🙂 Love this cake! So many layers! 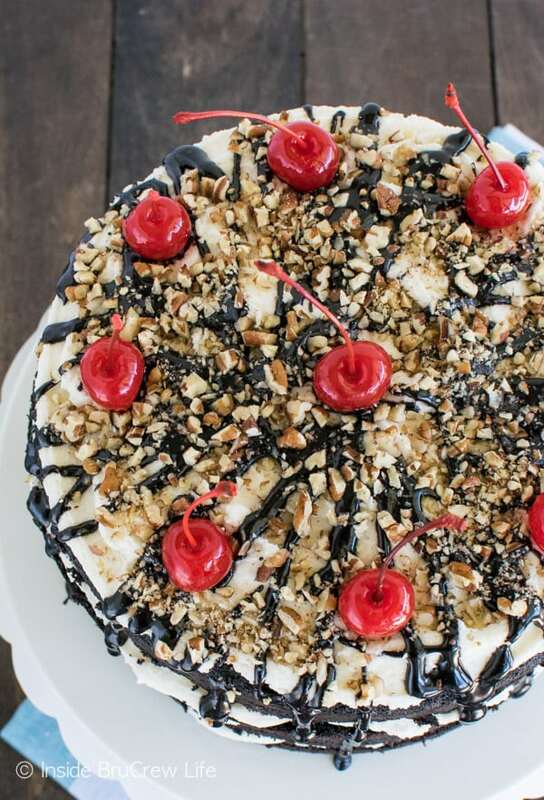 This is a showstopper- and that hot fudge? YUM. 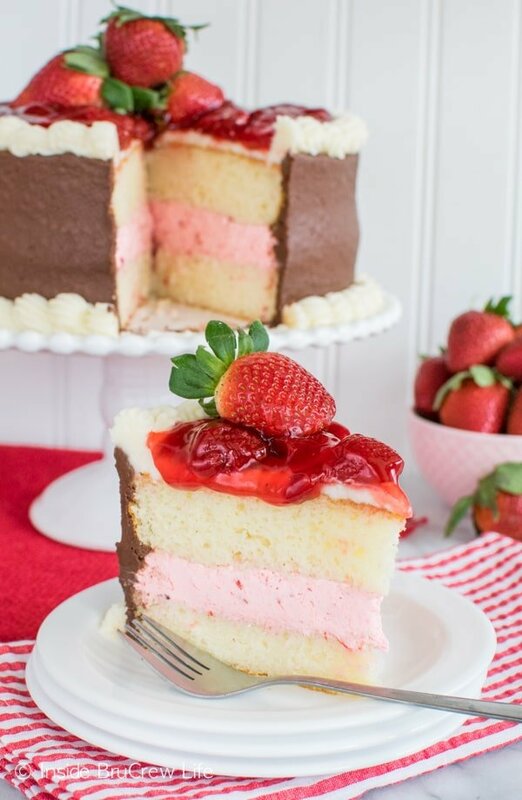 I’m all about layers in my desserts! And the drizzle of hot fudge was a definite must! 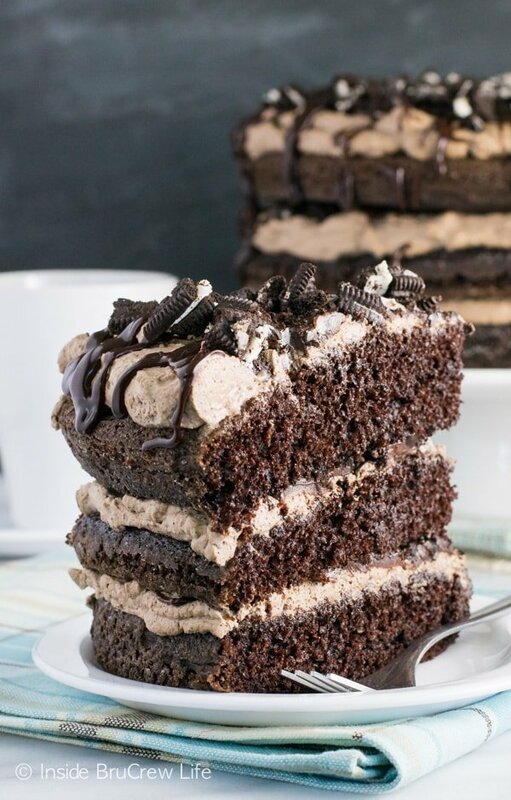 Absolutely love the dark chocolate layer cake, and can assure you that the best years of my life were my 40’s. No other age had the clarity, health, and knowledge all wrapped into one amazing decade!! I am definitely feeling the best that I have ever felt. I have a feeling 40’s are going to be great! There is just something fun about creating your own birthday cake, especially when it is something you love to do anyway! I don’t like birthdays for myself either…..they are not for me …lol…I thank God that I made it another year…..and leave it like that……birthdays are for kids…..like Christmas is for kids……that’s how I look at it….. Happy birthday!! I love baking my own cake, too. But I also let someone buy me a cake. The more cake, the better the birthday! This one is really tall and stupendous. The cherries are a great finishing touch, too! Happy belated birthday! This cake looks like the perfect way to celebrate a birthday! Love it! I hope you have a wonderful birthday!! And this cake! I too also love dark chocolate! Thank you so much! And I’m convinced dark chocolate is always the way to go! Happy Belated Birthday! This cake looks like the perfect way to celebrate! 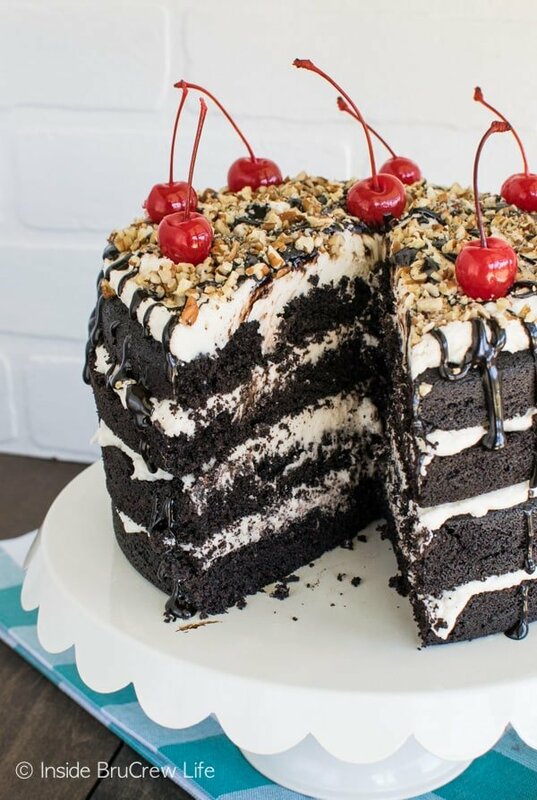 And yes, one of the most important things in life is big slice of cake every once in a while! Thank you…and I agree 100% with you! This looks INSANELY DELICIOUS!!!!! I could seriously go for a giant slice right now. And Happy Big 4-0!! Thank you so much girlie!!! And I could totally go for another slice of this cake too…it was awesome!